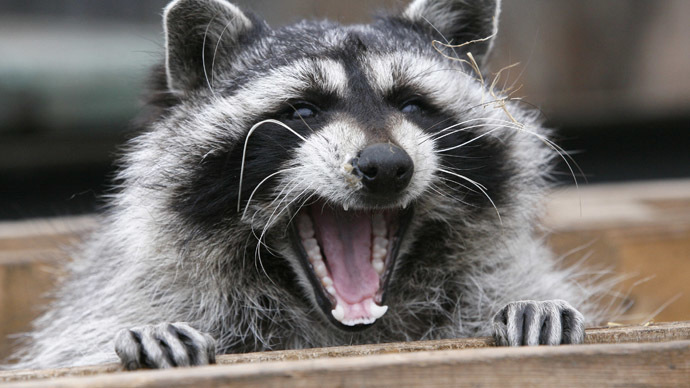 Three raccoons broke out of their cages and caused havoc at a mobile company’s office in Moscow. The crimes of the striped perpetrators, who overturned boxes and destroyed equipment, were caught on a CCTV cam. The raccoons arrived at one of the offices of Russian mobile broadband services provider and smartphone maker, Yota-System, together with their animal trainer. The woman, who went to the office to buy a signal booster, reportedly left the cages containing the raccoons unattended as she had to run to the nearest ATM. While she was withdrawing cash, one of her raccoons seized the moment and successfully opened its cage. Not only did the raccoon escaped, it also freed its mates. The three then launched into vigorous activity in the office, overturning every box they found and destroying tow antennas. The company estimated that the damage caused by the animals stood at at 44,000 rubles (around $850), 360 Podmoskovye channel reported. But both sides decided to settle the matter out of court, agreeing that the animal trainer will just stage a free performance for the children of Yota-System’s employees.